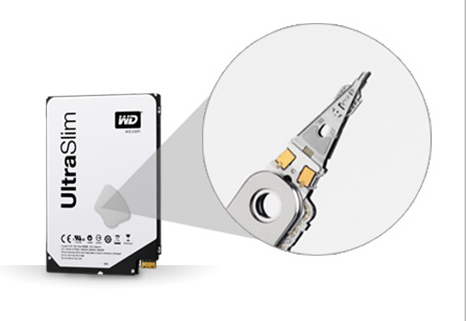 Western Digital has announced the world’s slimmest hard disk drive. Measuring just 5mm thick, the WD Blue ultra-slim hard drive is 47% thinner than conventional hard drives, and for comparison, 35% thinner than “most popular smartphones”. It also incorporates the company’s exclusive noise reducing technologies, resulting in it producing only 17 decibels when in seek operation. In addition, the WD Blue ultra slim hard drive is also made from stronger aluminium materials and a harder Tied-Shaft motor which increases drive pinch strength as much as 30 percent, resulting in a more rigid structure. It also sports the Dual Stage Actuator which reduces vibrations and increasing drive reliability. Currently, there is only one variant in the WD Blue ultra-slim hard drive, which is a 500GB 5400rpm drive. However, future variants include a WD Black solid state hybrid drives (SSHD). The 500GB WD Blue ultra slim hard drive will retail for $89 (approximately RM276). However, there is no word yet for consumer availability. For more information, head on to WD Blue’s product page here.